Have a safe and relaxing break. We look forward to seeing you back at school on Tuesday, March 28. Are you having a "staycation?" Join us for a Pony Activity Night on Tuesday, March 21 at Stillwater Junior High from 6-8:30 p.m. The pool will be open at 6:30 p.m. This event is free if you sign up in advance online. Do not be alarmed if you see emergency vehicles in front of Oak Park Elementary over spring break. 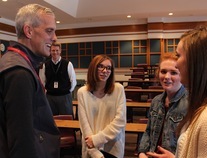 Emergency responders from across Washington County will be participating in a training exercise at the school on Thursday, March 23 from 2:30 until about 11 p.m.
Former White House Chief of Staff and Pony alum Denis McDonough stopped by Stillwater Area High School to visit with social studies students. McDonough, who graduated from Stillwater in 1988, talked about what it was like serving as President Obama's right-hand man and how he got the job. McDonough said in order to work in the White House you need to be a voracious reader and complex thinker who can summarize well and quickly. He added that curiosity is the key to success. See a video clip from his visit. Senior Dylan Cook won the top prize in the Les Farrington Best 100 Juried Art Exhibition. Dylan’s photography portfolio also earned him a $2,500 scholarship. Read more. Five SAHS students were recognized in the 2017 Minnesota Scholastic Arts and Writing Awards. It's considered the most prestigious high school arts and literary arts competition in the country. Read more. For the 13th year in a row, the Association of School Business Officials (ASBO) International has awarded Stillwater Area Public Schools its Certificate of Excellence in Financial Reporting for having met or exceeded the program’s high standards for financial reporting and accountability. Read more. Author Stephanie Bodeen visited Andersen, Lake Elmo, Marine, Oak Park and Withrow elementary schools to talk about the writing process. Read more. Struggling readers are finding encouragement, support and friendship from junior high tutors. Read more. digitalBackpack is out. Peachjar is in. The district is launching a new electronic flyer communication tool called Peachjar, which will replace our former digitalBackpack webpage. Peachjar will automatically send parents an email with links to flyers from non-profit organizations that offer opportunities for our students. The e-Flyers will also be posted on school websites. Learn more. Community Education is offering 36 NEW classes for adults this spring/summer! Among the latest offerings: golf lessons, dog training, smart fitness with heart rate monitors and more! A special catalog just for adults will be mailed out after Spring Break. Registration is now open online.